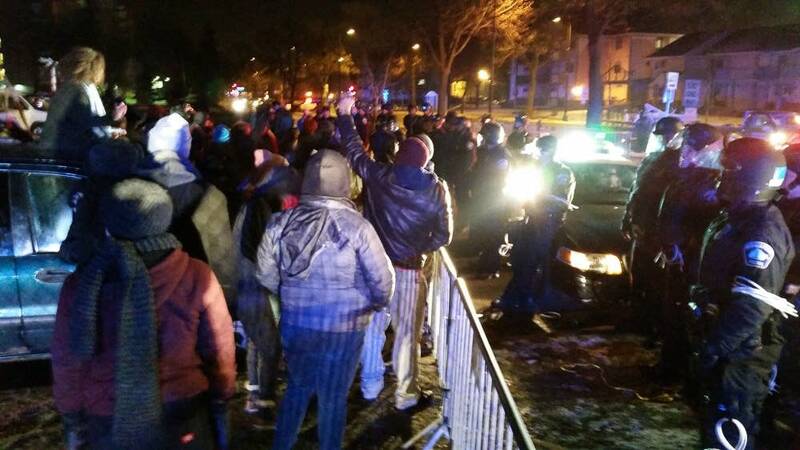 Updated: 9:20 p.m. | Posted: 5:21 a.m.
Minneapolis police cleared a protest camp and arrested eight people outside the city's 4th Precinct station early Thursday morning. A few hundred protesters reacted by occupying the rotunda of Minneapolis City Hall for a couple of hours in the afternoon. The peaceful demonstration at City Hall moved into the street with around 100 marchers heading up Hennepin Avenue and across the river. Several groups of protesters including Black Lives Matter converged on a restaurant and bowling alley in northeast Minneapolis. Protesters had planned to disrupt what they described as a fundraiser for the Minneapolis police union. As the protesters arrived at Elsie's on Marshall Avenue, attendees of an event for Hennepin County Sheriff Rich Stanek's campaign volunteers were leaving. After speeches and chants, the crowd walked north on University Avenue to the headquarters of the Police Officers Federation of Minneapolis. They stood in a circle for less than 30 minutes, hung signs on the chain link fence and walked away. Before police cleared the 4th precinct camp, protesters had occupied the area with tents for the last two weeks to demand more information about the shooting death of Jamar Clark by a police officer in mid-November. One block of Plymouth Avenue North has been closed to traffic by protesters during much of the occupation. Earlier this week, Minneapolis officials and community leaders called on protesters to end their occupation, saying it had become a public safety hazard. Black Lives Matter organizer Mica Grimm said officers gave protesters an ultimatum shortly before 4 a.m.
"Officers started handing out a piece of paper that said our valuables needed to be collected within 10 minutes or we were going to be arrested and our valuables were going to be confiscated," Grimm said. Police herded protesters across Plymouth Avenue North, where a line of police in riot helmets set up metal barricades. At least one tow truck was seen loading up a camper trailer. Black Lives Matter organizer Michael McDowell said protesters left voluntarily and peacefully, although there were a few confrontations with officers. At one point, protesters knocked down the barricade. Police righted it and told protesters they would be arrested if they do it again. "We were able, with our marshals, to move folks out," McDowell said. "There was intimidation, with cops grabbing folks and things like that, but ultimately we were able to get everyone out safe." As many as 100 protesters were on the scene during the peak of the standoff on Thursday morning. 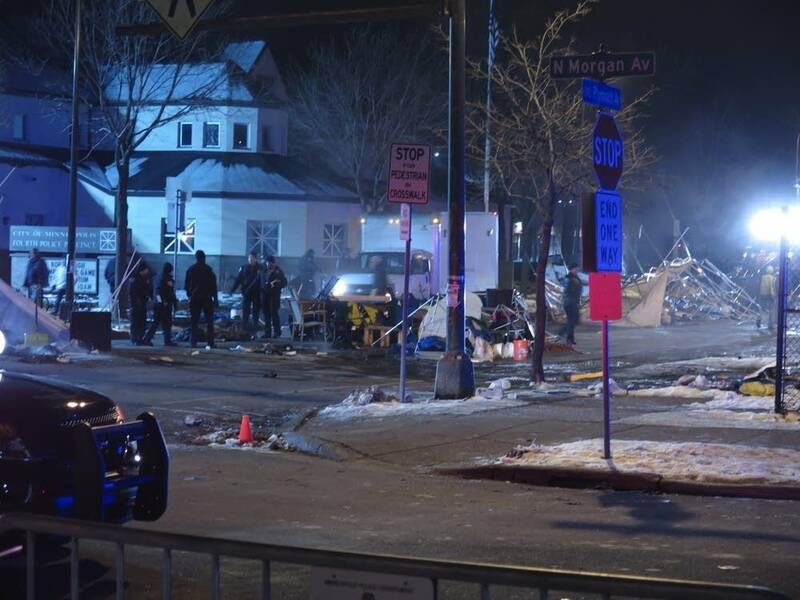 Almost all protesters had left the site shortly before 6 a.m.
Minneapolis Mayor Betsy Hodges said at a press conference on Thursday morning that it was the right time to clear the camp and reopen Plymouth Avenue North. "We have been balancing the safety needs of the precinct with the right for people to protest and have their voices be heard," Hodges said. "But the increasing safety risks and impact on the neighborhood, the impact on our ability to provide services in the city, made this morning the time to do that." Hodges thanked police officers for their professionalism during the clearing of the camp. She also thanked protesters for their peaceful, but involuntary, withdrawal from the camp. "It is time to pivot to a moment of working together on the issues we all care about to create one Minneapolis and move forward together," Hodges said. Minneapolis Police Chief Janee Harteau said law enforcement officials have been planning the best way to clear the protest camp since it became obvious that protesters weren't leaving on their own. Harteau said protesters were given four dispersal orders, including a written copy. Seven protesters were arrested on Thursday morning for obstructing a legal process and one person was arrested for trespassing. "We allowed them to leave on their own, to just move outside the perimeter, and not everybody left," Harteau said. Harteau said the protest camp has cost the police department about $750,000 in overtime, not counting Thursday's actions. 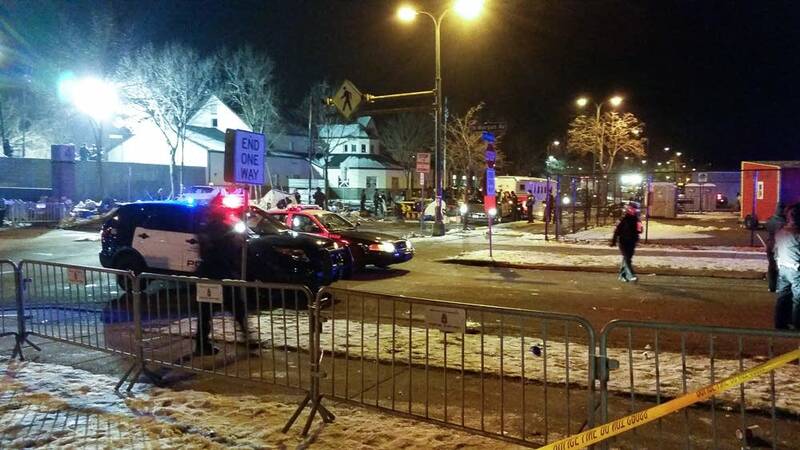 Minneapolis Police Department spokesperson Scott Seroka said no injuries have been reported. Crowds of demonstrators and heavy smoke from wood fires that accompanied the protest camp are gone from the 4th Precinct. Work crews have attached tall wire fencing atop cement traffic barriers between the sidewalks and the street. The block of Plymouth Avenue North in front of the precinct remained closed to traffic through mid-morning. Sharon Powell, 52, lives just a few houses down the street from the precinct. She welcomes the end of the protest, which she described as an "eyesore." "I think they should have stopped doing this a long time ago," Powell said. "That's my opinion." Powell said smoke from the fires did not bother her, but the noise and crowds did. "I work the third shift, they wake me up before I need to wake up," Powell said. "[There's] nowhere to park in our neighborhood." Meanwhile, Black Lives Matter Minneapolis announced plans for a protest at Minneapolis City Hall at 4 p.m. on Thursday. "[W]e will converge on City Hall in response to our Mayor and City Council's continued brutality against peaceful protesters who have endured a white supremacist terrorist attack, police violence, and freezing temperatures to demand justice for Jamar Clark," according to the group's Facebook event. The group also reiterated their demands that authorities release tapes associated with Jamar Clark's shooting and appoint a special prosecutor in the case.